I was browsing modcloth (all items above are from modcloth.com) just to look around, try to get some inspiration, try to see if anything tickled my fancy. I encountered two problems. 1. I see things I think are cute, but the styles of the things are all over the place (as you can see from the above collection). It is like I have lost any kind of direction in personal style, and mix and matching stuff like this doesn’t always work. It is hard to wear a classy mad-men type of dress and combine it with a pug-party-ring. I don’t know what happened to my sense of taste (or lack thereof), but god, I can not seem to settle for any sort of style. And I have been feeling, maybe for the past two years or so, that I am getting to old for quite a few styles, and I feel that I need to grow up and not dress like a teenager anymore. And I am kind of stumped, because I still come across things that glitters like god and go “ooo! I want that!” even though the item does not match a single thing in my mostly black closet. So – how do you guys solve this? Settle for a style and keep to it? 2. The second “problem” I encountered is not really a problem; I do not feel inclined to actually buy things anymore. I look at things, think they are cute, but I don’t feel that yearning or longing for all sorts of items like I did when I was younger. I can easily walk into several clothing stores now, look through their collections, conclude that yes, certain garments are pretty, but I don’t feel like they are pretty enough to spend my money on them. After I have moved back and forth to Japan, I do not want to carry a shitload of clothes and whatnot with me, and right now I am living in a 5 square meter room, and I simply do not have enough space to keep a huge wardrobe. And it feels strangely liberating. Owning fewer things, getting by fine with fewer things. When I was younger I would keep closet upon closet filled to the brim, but going through old clothes now, I realize that most of the items are unnecessary, so I have thrown most of them away. And you can do it as well! Clean out your closet, and just throw out all the old junk you are never going to wear again. There is no point in letting things clutter up your life. That being said – I miss that feeling of really falling head over heels in love with items. The only thing I have truly been wanting to buy all year was a pair of JC shoes. What do you do to get excited over items? Winter is coming, and I lack a couple of base garments, but I can not bring myself to go out and look for them, because most things are just so utterly uniteresting to me. I think life is too short to settle on one style. One day we can be well-dressed and the other day be more casual. It’s more fun this way. By the way I was browsing http://www.milanoo.com for cheap wedding dresses, just for fun. I agree with you. I have always switched styles from day to day when I was younger, but I kind of have this feeling at the back of my head that it is time to grow up and dress like an adult, you know? I can not seem to find any consistency to the things I like these days. I think you can wear what ever you want along with what ever you like. But hey that`s me. I don`t have a style. I have a library of impulses. It seems so nice. My problem is that I just haven’t found anything I have loved lately. I can not decide if it me or what’s in right now that’s the problem. I understand what are you saying, i get rid of most of my clothes a few weeks ago, and you’re right it’s liberating, letting go some stuff that i never going to wear. Oh, thank you so much for the link, I will check it out! 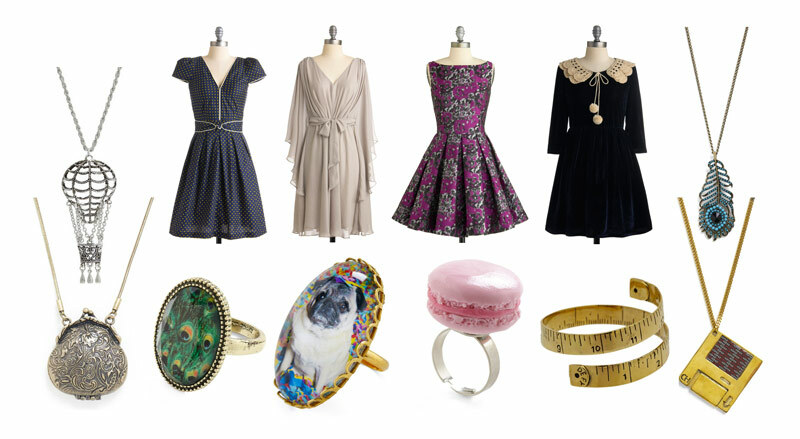 i would have worn the pug ring (i have a Mother Mary ring just like it) with the magenta and gray Madmen dress when i was young and cute and would never have known that it wouldn’t go together ;). and i think any one of the 3 necklaces would look sublime with the draped white dress – i love them all, but especially the peacock feather necklace. i seriously want that one. the 2 silvery necklaces (or is the purse one actually a purse, not a necklace?) would also work well with the blue dotted dress. i guess what i’m saying is that these things WOULD still work mixed and matched, but they’re just not inspiring you these days. i have boxes of beautiful vintage clothing, shoes, hats, scarves and jewelry from the 1920’s to the 1970’s, but i have no real desire to wear them anymore – i’m going to try to sell all but the jewelry on Ebay now. you’re still young and shapely enough to pull that funky style off if you want, but if you don’t want, don’t worry about it – you never know, you just might find inspiration again in a year or two. but i don’t think you can force it. Jeg er også ganske lei av ting. Ofte når jeg kjøper nye klær eller nytt tilbehør, blir det gjerne ikke brukt mer enn et par, tre ganger. For det meste blir det bare liggende og ta plass. Et strammere budsjett enn før gjør det også vanskelig med innkjøp av annet enn nødvendigheter – det svir litt i lommeboka og i samvittigheten. Ja, jeg er helt overgitt over hvor mye smykker og tull jeg fant når jeg ryddet i boden nå altså. Aldri mer kjøpe tullball, det holder for meg nå. Jeg trenger ikke mer smykker fra HM altså, det er sikkert og visst!